Our ClearPoint system is intended to provide stereotactic guidance for the placement and operation of instruments or devices during planning and operation of neurological procedures within the MRI environment and in conjunction with MR imaging. The ClearPoint system is intended as an integral part of procedures that have traditionally used stereotactic methodology. These procedures include biopsies, catheter and electrode insertion. The system is intended for use with 1.5T and 3.0T MRI scanners. The ClearPoint system enables real-time visualization for neurosurgeons while they operate. Learn more. Using the ClearPoint system, neurosurgeons can guide the catheter to the target area for delivery of focal laser ablation therapy. Learn more. 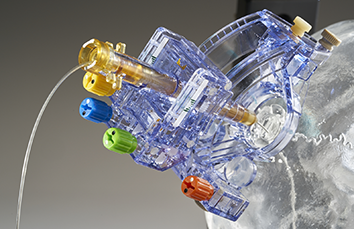 The ClearPoint system provides direct visualization and guidance in placing drug infusion catheters for the delivery of therapeutic agents to target locations in the brain. Learn more. The ClearPoint system's real-time visualization makes it possible for surgeons to see the needle during a biopsy to confirm tissue is being retrieved from the target location. Learn more.